Posted in Software, Updates by RaMMicHaeL at October 24th, 2014. Can you in the future add features like call the charms bar at the right bottom corner ? like windows 8.1 do..
Quite unlikely, especially as a part of 7+ Taskbar Tweaker, as the charms have little to do with the taskbar. I think is only question of reactivate the trigger at the right corner. For example like you did with sound control and mousescroll at systray .. I haven’t used Windows 10 extensively, but as far as I know, the charms bar is gone completely. So it’s not enough to add a trigger, you’d also have to implement the charms bar itself. Also, it still is not related to the taskbar. e.g. move your taskbar to the left – the hot corners are still on the right. i see !! you are right .. nothing to do with the taskbar ..
thank you for explaining ..
new updates for windows 10 rtm, keep it up! Just wanted to know when the “no fixed width” advanced option would be working again- I really like my task bar to be really thin on the left side of my screen- it’s pretty much the only feature I severely need 7+ for. I donated for alpha access and got it but the feature doesn’t seem to be working. I’m sorry I wasn’t able to donate much, but wanted to take the time to say thanks for your awesome utility. I guess I’m guilty of taking it for granted – until I update to a new version of Windows, and realize how much I’ve come to depend on 7+TT, and how cumbersome Windows is without it. I wanted to let you know that I really appreciate your time and effort on this. While I’m sure the donations are a nice little bonus, I know they don’t come close to compensating you for all you put into this. THANK YOU! After upgrading to W10 without first uninstalling 7+TT I had a message appear on my screen saying that the application is not compatible with the new OS yet. I’m waiting for the release of a new version so I can see if it will fix everything. 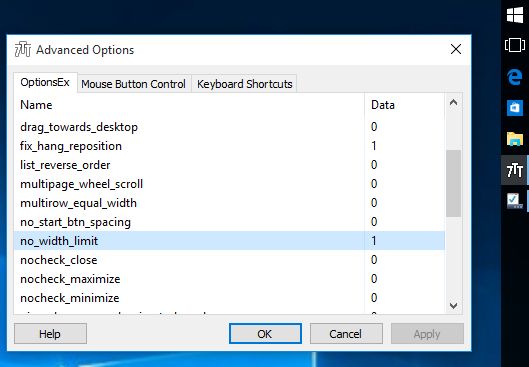 The lack of 7+ Taskbar Tweaker should not affect the system in any way, even if it was installed previously, because the tweaker does not permanently change system settings. Perhaps it’s caused by another conflicting program on your computer? There is any chance to do the transparency option works like in the Windows 8.1 ? now the effect its more like blur .. there no option to choose the color intensity .. Probably not in the near future, but feel free to create a topic on UserEcho, and I might look at it one day. that is a windows 10 clean install with 7 tweaker. What happens when you launch sndvol -f (Ctrl+R -> “sndvol -f” -> OK)? Are you seeing the same black square? Here “ctrl + r” doesnt work .. i have to run the command in the new “search menu” .. then i had this result. That’s wired, because 7+ Taskbar Tweaker just launches the sndvol process, so the result should be the same. The only difference is that it adds a mouse coordinates parameter, such as: SndVol.exe -f 0, where 0 is the coded mouse location. Try running SndVol.exe -f 0, does it still show correctly? And does the tweaker still create a black square? If both answers are yes, then I really don’t know what’s going on. All I can do is offer some modified builds to try and narrow down the cause of the issue.